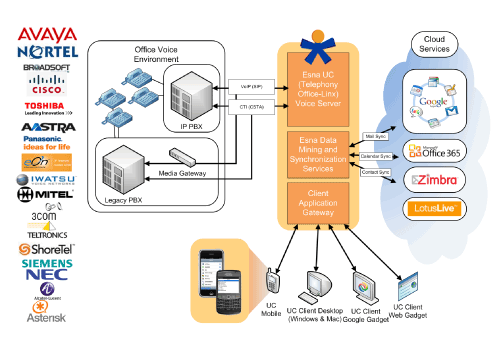 Esnatech, today announced the release of version 8.5 of Office-LinX, a unified communications platform that enables enterprises to integrate UC with cloud-based technologies such as Google Apps, VMware Zimbra , Salesforce.com, and Microsoft BPOS/Office 365. Office-LinX is optimized to work in mixed, distributed environments integrating with multiple on- and off-premise telecommunications technologies and cloud-based applications and infrastructure. It can for instance integrate with solutions from Asterisk, Avaya, NEC, Cisco, Toshiba, Panasonic, Shoretel, and more. The latest high availability (HA) version of Office-LinX supports full virtualization of its voice clusters with VMware vSphere support. With Office-LinX 8.5, organizations have the ability to distribute the application and resources over multiple virtual servers connected to a single or distributed telephony infrastructure. This ensures both uptime and real-time synchronization of mission critical communications infrastructure. Esnatech was the first UC solutions provider to offer high availability in Office-LinX version 7.1. Esnatech claims the latest Office-LinX 8.5 provides the industry’s "only high availability infrastructure in which every UC node across the network is replicated in real-time within an organization’s existing VmWare infrastructure, enabling enterprises to consolidate all their voice applications to a central, distributed license."